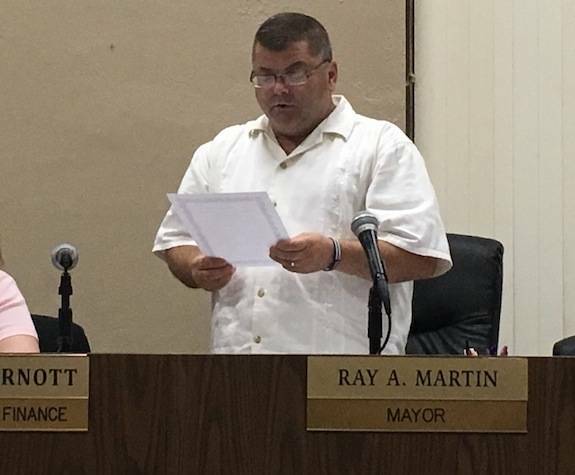 West Jefferson Mayor Ray Martin reads a proclamation marking September as Prostate Cancer Awareness Month for 2018 at Monday’s village council meeting. Land continues to top the list of business in the Village of West Jefferson. Council discussed a number of legislative actions Monday regarding development projects in the village. One, titled Project Maple, has yet to go public with details but the second, pertaining to Project Condor, deals with the upcoming Amazon facility. With council’s approval, John Mitchell, Public Service Director for the village, is entering an agreement with Choice One Engineering to provide administrative services during construction improvements to the intersection of S.R. 29 and U.S. 40. The resolution was approved at a cost not exceed $56,000. Council also heard the first reading of a second petition to narrow Veterans Way from 33 ft. to 24.6 ft. The topic had gone before council previously in May when John Harmyer of Fisher Cast Steel Products, Inc., filed the first petition. At the time, the entire scope of the project was not detailed in the initial petition, prompting Harmyer to draft a second one. Since the legislation was on its first reading before council, no vote was taken. Council also voted to temporarily waive Section 549.09 of the village codified ordinances which would allow bow hunting on certain land within the village. Seidel said the program will be done by lottery and there will be six hunters per two-week period. Hunters are welcome to enter into all nine hunts but must attend the meeting for the hunt to enter the drawing. Ohio’s regular deer archery season begins Sept. 29. • Proclaimed September 2018 as Prostate Cancer Awareness Month in the village. Mayor Ray Martin read out a proclamation highlighting the importance of awareness. • Authorized various supplemental appropriations in the General Fund as well as Capital Projects and the water treatment plant. • Approved a supplemental appropriation of $15,000 to the village pool fund. • Approved a supplemental appropriation of $15,000 for new sound and recording equipment for council chambers.